Croatia v England was another epic battle involving two teams that had in many ways exceeded expectations. In the end, it was Croatia to win this battle of will to advance to the final. The atmosphere was electric at the former Lenin Stadium and when England took an early lead the roof was about to come off. Luka Modrić, who was once again dropped deep rather than playing in the number 10 role, had brought down Dele Alli just a few yards outside the box, and Kieran Trippier stepped up to curl the ensuing free kick over the wall. Goalkeeper Danijel Subašić could have done perhaps a bit better as he mistimed his dive by just a moment. It was a critical first goal that gave England stability and meant that Croatia had to attack, which played into the hands of Gareth Southgate’s 3-5-2 system. Croatia, in fact, appeared almost frazzled by England’s game and attempted to bring in some structure into what was considered their strongest asset – their midfield. Croatia’s backline also struggled with Subašić playing a poor pass to Ivan Strinić in the 22nd minute. The left-back then played a ball straight into Dele Alli’s feet, the Tottenham midfielder, however, passed the ball to Harry Kane, who was offside by several yards letting Croatia off the hook. That sequence was exemplary for Croatia’s problems in the first 30 minutes as the Vatreni struggled to maintain structure in their midfield. “I think we played very well in the first half. We should have scored a second goal at this point as we were in control,” Southgate would later explain. England were certainly in control at this point and should have added another goal or two. After all, it took until the 31st minute for Croatia to record their first decent chance. Modrić had carried the ball deep down the right flank not finding space to get through he laid off the ball for Ante Rebić, and Jordan Pickford had to do well to stop his curled effort from 16-yards out. Croatia had to attack allowing England the room to counter-attack and Jesse Lingard had the chance to double the lead after he was picked out by Kane at the top of the box in the 36th minute, his shot, however, ended up wide of the target. 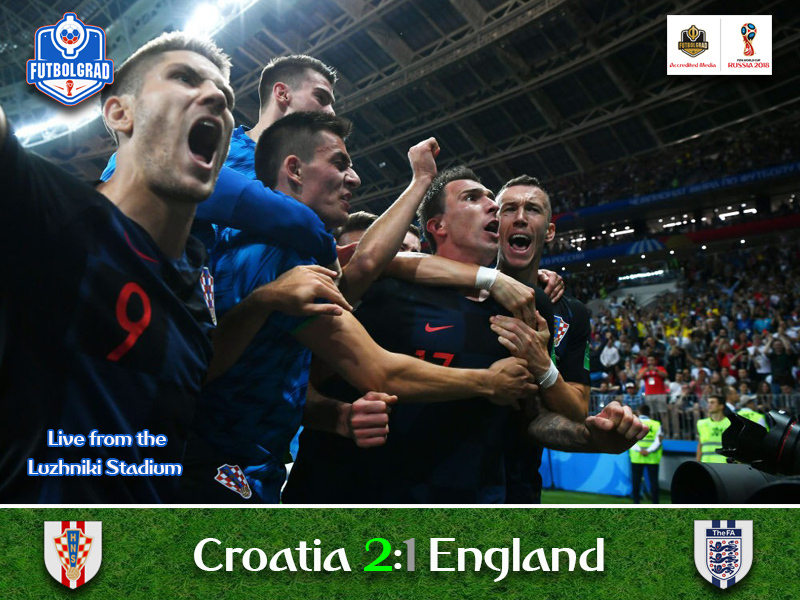 Overall, England dominated the second half as Croatia were struggling to get a proper foothold in the first 45 minutes and not even a Pickford howler in the dying moments could aid Croatia. The Three Lions keeper played a ball straight into the feet of a Croatia, and the ball eventually ended up with Ivan Rakitić, but the midfielder failed to lay off the ball or execute a shot. For Croatia, the tank appeared empty, which at the beginning of the second half played into England’s hands. The Three Lions handed over much of the initiative to Croatia, and the Vatreni were too tired to produce anything of substance. In the 55th minute, in fact, England should have once again doubled the score. Trippier played a fantastic low cross from the left flank, Kane dived for it, but Dejan Lovren managed to get a foot in to block the chance. It was the only time Kane came anywhere near scoring throughout the game. The Tottenham striker, who is leading the goalscoring chart with six goals was absent for most of the match and will have to take some of the blame for England going out. Furthermore, the goal acted almost like a wake-up call for Croatia, because around the hour mark Croatia finally got into the match and in the 65th minute, Ivan Perišić had a chance to equalise. With Croatia sitting deep in England’s third the ball was moved around the box until it found the Inter Milan midfielder nine-yards out and Perišić unleashed a shot that was blocked by Kyle Walker at the last minute. Three minutes later in the 68th minute, Perišić had his goal. Sine Vrsaljko played a deep cross into the box, which Walker tried to clear by a diving header but the defender failed to pick up on Perišić, who had been left free and dived in with a high boot to score. The goal shocked England and brought chaos to its backline. In the 72nd minute, Croatia almost added another when Pickford and his defence failed to clear the ball. The ball landed at Perišić, and the Three Lions were lucky that the Croat only hit the woodwork and that Rebić failed to convert the rebound with his shot landing straight in Pickford’s arms. Croatia where pushing and Gareth Southgate reacted by bringing on Marcus Rashford for Raheem Sterling. It was a change that made sense. England needed a set of fresh legs, and Southgate hoped that Rashford’s pace would provide England with a better attacking balance. England tried to keep the pace up, and as a result, an open match resulted in which both teams had plenty of space to attack in. In the 82nd minute, Mario Mandžukić produced the next chance. The Croatian forward received a long pass inside the box, stopped the shot with his chest and volleyed the ball on goal where Pickford was in place to prevent the shot. Speaking of Pickford, the England keeper seemingly struggled with his composure as the match wore on with his passes played all over the field and struggling with high crosses. It was a weakness Croatia failed to pick up on as many of the crosses played by the Vatreni were entirely off target. England, in the meantime, struggled to get back into the match and as the time run out on the regular time, it almost looked like it was the Three Lions and not Croatia, who had played the two previous matches over the full 120 minutes. Once again it was into extra-time for Croatia. “The strength they showed was remarkable”, Zlatko Dalić later explained. The Vatreni needed the full 120 minutes and penalties both against Denmark, in the round of 16, and Russian, in the quarterfinals. But even more remarkable with 330 minutes played over the last three games Croatia head coach Dalić did not make his first change until the third minute of extra-time when Strinić went down with an injury and had to be replaced by Josip Pivarić. “I wanted to make a change. Nobody wanted to be subbed that showed character. That made me proud. Never give up was our attitude,” Dalić added. “We took back control in extra-time. We should have scored our chances”, Southgate would later reflect on the extra-time period. England were certainly in control and as Southgate explained should have scored in the 98th minute after John Stones found himself with plenty of space in the penalty area, but his header was cleared off the line by Vrsaljko. Croatia, in the meantime, almost appeared to take a breather trying to recover from expending all their energy in the second half. Only in the dying moments of the first interval did Croatia wake up and produced their very own chance in the 106th minute when a low cross found Mandžukić wide open in the area. Pickford, however, stormed out of his box meeting Mandžukić’s shot keeping the score even at 1-1. The second half started with another Croatian chance. Perišić was left open after a low Modrić corner, almost surprised the attacking-midfielder missed the goal by several yards in the 106th minute. But Croatia only lamented for a moment as in the 109th minute Mario Mandžukić scored to make it 2-1 with a deadly close-range finish after Perišić had extended a long ball into the area with his head. It ended up being the winner as Croatia managed to hang on against a Three Lions side that fought hard to get back into the match even after Trippier had to leave the pitch with an injury. In the end, it was not meant to be for England, who despite going out exceeded expectations at this tournament. “We are a nation of character and winners,” Dalić summed up. This was true as Croatia capped off another fantastic battles of wills to advance to the final. Ivan Perišić was the man of the match. The 29-year-old Inter Milan attacking midfielder was the driving force behind the Vrateni’s comeback victory. 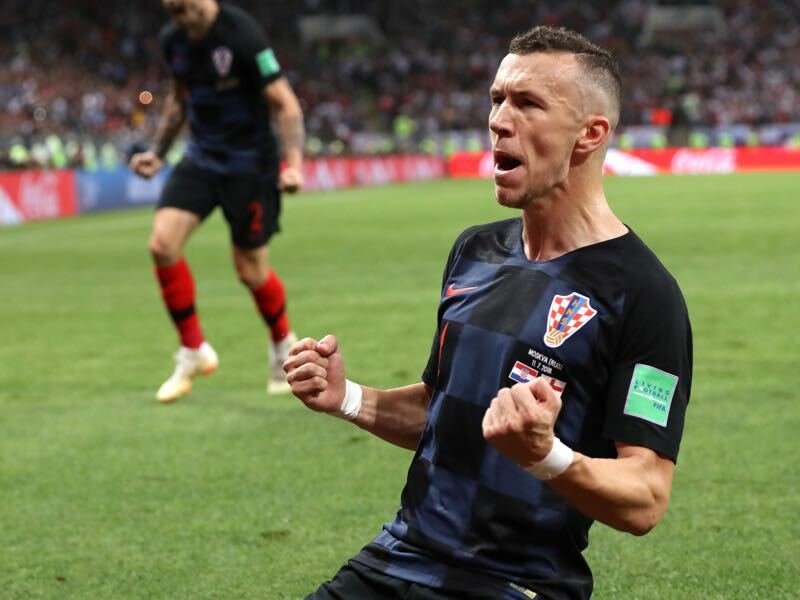 Perišić produced six chances and after scoring his goal hit the word work that would have probably saved Croatia from going into extra-time for the third straight match. Once in extra-time, Perišić continued to be the most dangerous man, and it was his header in the 109th minute that paved the way for Mandžukić’s winner. “I only headed the ball and Mandžukić was in the right place”, Perišić explained after the match. “It was a very difficult game, especially for a small country like Croatia,” he added. “We all feel the pain of the defeat, Gareth Southgate. When you played as well as we had you can imagine that the dressing room is in a sad state,” Southgate would tell the media after the match. “We can be proud but it is hard to put into the context. The team has broken through a number of barriers”, Southgate added. The English manager is right England have done a remarkable job at this tournament. The Three Lions exceeded all expectations by reaching the semifinals of the World Cup. England might be on the ground now but with the youth teams producing excellent talent, this Southgate side has a bright future. “We want to be a team that can hit quarterfinals, semifinals and finals. We have a new benchmark and I couldn’t be prouder of what they have done”, Southgate added. Kieran Trippier is only the second England player to score a direct free-kick goal at a World Cup (since 1966), following David Beckham who scored one in both 1998 and 2006. Croatia v England was decided in the 108:03 minute – Mario Mandzukic’s goal was the latest scored by Croatia and the latest conceded by England in a World Cup game. Excellent analysis. In my point of view, Perisic was also the best player. He took himself to the edge, never stopped and was rewarded with a great and decisive goal. Apart from that, Croatia has a well organized team, polite and, at the same time, agressive with a great belief. I think croatians will cause some problems to the french. What do you think, Manuel?